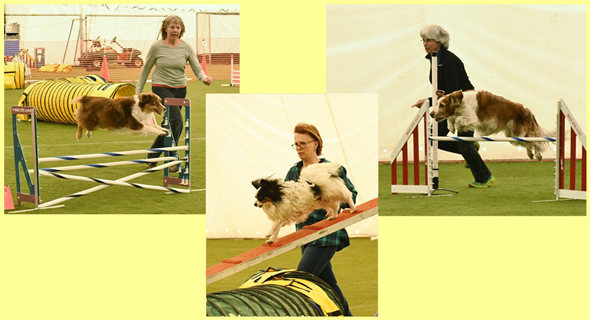 At left Nancy Waterhouse and her Australian Shepherd, Alice, heading for the finish line of her Level 1 Standard course at Breeze Thru Agility's April 14-15th CPE event held for the 6th year in a row at Indoor Action Sports, Greenfield, Mass. Center is Vikki Babcock and her Papillon, Roo, negotiate the dogwalk during their novice run and at right Lee Crocker and her Welsh Springer Spaniel, Finn, start the course (and finished it, too) in fine form. On a January night in 1993 . . .
. . . I attended my first night of dog agility class with my 5-year-old mixed breed, Breeze. Little did I know I was stepping into a whole new chapter of my life! As I learned how to teach the ever-exuberant Breeze to traverse planks, scurry through tunnels and soar over jumps, our already close bond was fastened even tighter. It was the perfect way to channel her energy and inspire my passion for training. She was a natural, we were a team, and I was hooked! 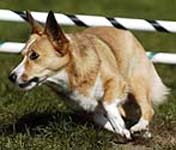 Over a dozen years later, I am still consumed by the thrill of teaching my dogs new behaviors and fine tuning our moves together out on the agility course. 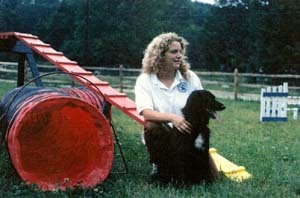 I began teaching for CATS (Canine Agility Training Society) of Keene, New Hampshire, a year later and found it equally exhilarating working with students to gain a higher level of communication with their dogs through agility training. 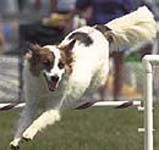 Breeze Thru Agility was born in early 1995 in the Brattleboro, Vermont, area. Using positive, reward-based training philosophy, I have been teaching a range of dog and handler teams to enjoy the sport ever since. It is as much of a joy for me to help beginner students delight in their dogs' first successful tunnel execution as it is to help guide competition-level handlers working toward the sport's highest titles! From the backyard recreational agility enthusiast to the serious handler headed to the national championships, my instructors and I offer insightful feedback to each dog and handler team we work with. Check out classes, upcoming seminars or contact me about private lessons at Breeze Thru Agility's new indoor, temperature controlled, fully matted training facility. 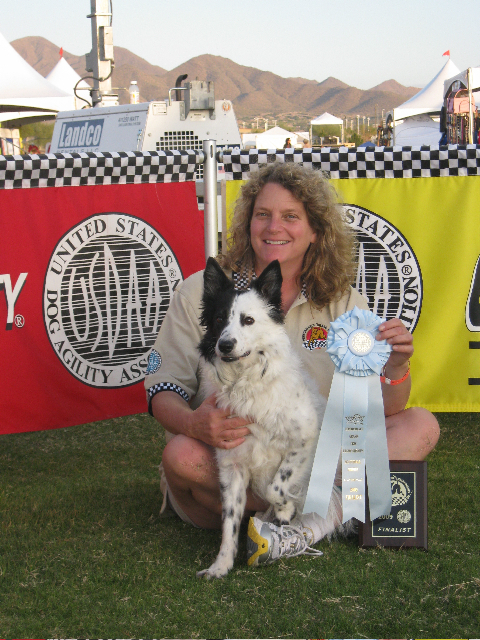 Elise and Spryte recently came in 10th at the Agility World Championships at the Cynosport Games in Arizona.